We also link our core subject English to our Creative curriculum. The texts we have chosen as a school link to topics in each year group. The writing the children do in their English lessons link to the creative curriculum topics. Our Curriculum teaches the children about real life and current issues we face in the world like: Global Warming, The Royal Family, Poaching, Deforestation, Recycling, The Media, Parliament, Import and Export, Endangered, Rare and Extinct animals, World disasters such as Earthquakes, Flooding, Tornadoes, Volcanoes, Farming, The Local area and lots more. Each half term prior to a new topic there will be a ‘Research Project’ where the children will be asked to find something out or create a piece of work linked to what they will be learning about in school. For each topic we encourage the children to bring in any books, objects, postcards, artefacts they may have linked to the topic to share with their classmates. Please ensure any items are named, it is the child’s responsibility to keep these safe, so please do not send things that are valuable or irreplaceable to school. Where possible a trip linked to the topic will be planned to extend the children’s understanding and knowledge of what is being taught. Each year group will go on two trips per school year. For example Year 3 visit Cadbury World as part of their Chocolate topic, Year 1 visit Cannock Chase Toy museum as part of Victorian Toys, Year 4 visit Dudley castle as part of their topic Romans and Celts and Year 5 visit RAF Cosford as part of the topic World War 2. Trips are beneficial to the children because they exposure them to new cultures and increase their confidence and motivation. As a celebration each term we invite Parents and Carers into school to complete a parent workshop. This involves a morning or afternoon session of creative challenges, where children are encouraged to work with their chosen adult to complete a range of crafts from castle making, to Viking ship building to rocket making and many more. These sessions have been a great success and enjoyed by all. Not only are the children supported in their learning, but, we also encourage quality one to one time with a relative. Year 1- Dinosaur topic. Children had excavation kits to dig out the dinosaur bones like archaeologist. Year 2- Wriggle and Crawl topic. A visit to school from the animal man. Year 3- Tribal Tales topic. Visitor perform a play about Prehistoric Britain. Year 5- World War 2. Ruth Barnett - the Holocaust survivor talks about her experiences. 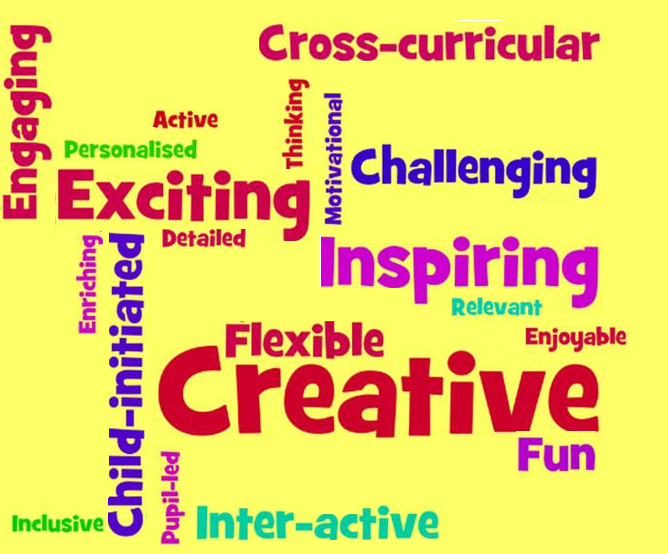 Here is a list of the topics for our Creative Curriculum.